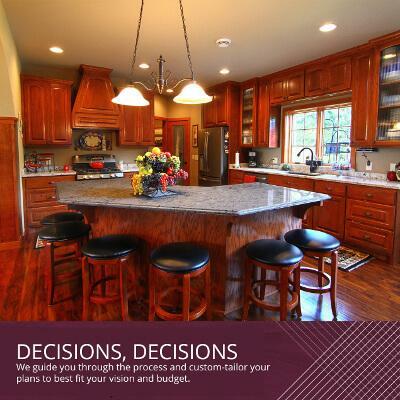 B-Dirt, Crosslake custom home builder, offers expert guidance every step of the way when making all the myriad decisions for your dream home. We guide you through the process and custom-tailor your plans to best fit your vision and budget. From exterior choices such as siding, siding color, roofing, and garage doors, to interior cabinets, sinks, fixtures, and doors—B-Dirt is here to assist. 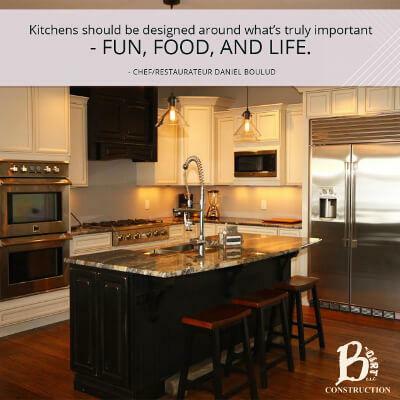 Not only that, but our staff directs you to trusted vendors to help with exterior selections, flooring to countertops, doorknobs to light fixtures, B-Dirt will help you select it all. B-Dirt works within your budget and knows which factors affect both your budget and the style of your home. If you have an expensive vision but less expansive budget, the expert staff at B-Dirt will walk you through more cost-effective options. Whatever your dream, we will bring it to life. That's the B-Dirt difference. Call (218)-821-5243 today for your free consultation. 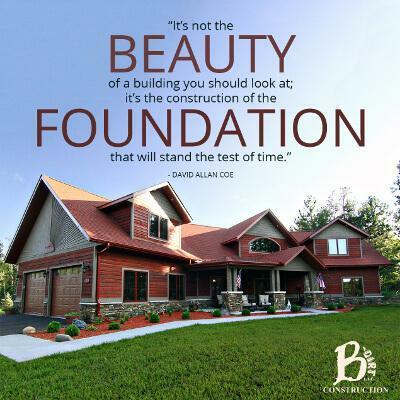 B-Dirt, Brainerd residential home builder, understands better than most how many decisions go into crafting the finishing touches on your dream home. We understand that sometimes we change our mind about wanting a brick rather than stone fireplace, or wanting to add additional windows, or even different door knobs. B-Dirt keeps in constant contact with you as progress is being made, so you will know well in advance when you may request any revisions. B-Dirt strives to keep you well within your budget, and will let you know how any changes will affect it. With B-Dirt, you build with trusted experts who want to give you all the finishing touches you desire to make your custom house your dream home. Revision needed? We will roll with it. Call (218)-821-5243 today and discover the B-Dirt difference. B-Dirt, Crosslake custom home builder, offers the very best in energy efficiency for our clients. 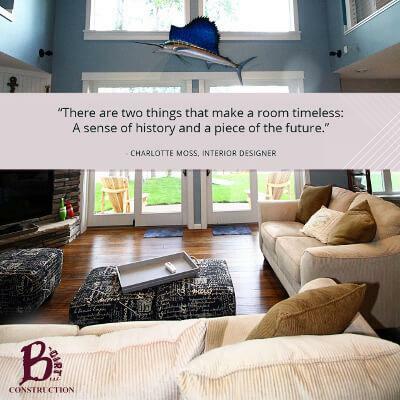 Our skilled employees use the most modern, proven techniques to maximize the value and efficiency of your new home. Our Insulating Concrete Forms (ICFs) greatly reduce heat loss. Blown-in blanket insulation offers maximum coverage and increases the value of your home. B-Dirt also offers dual-heat systems which allow you to switch between gas and electric heat, along with lower kilowatt rates at most utilities. Our James Hardie cement board siding has won numerous awards for its durability. When you build with B-Dirt, you're not only building your dream home, you're ensured the best possible investment for the future. Call (218)-821-5243 today and become part of the B-Dirt family. We look forward to building with you! 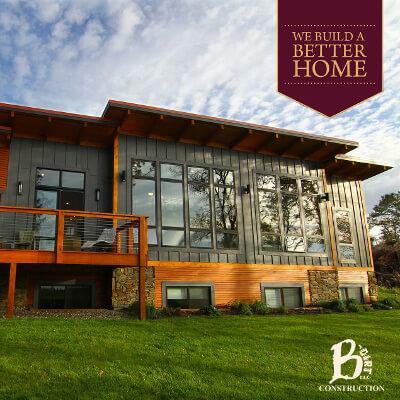 B-Dirt, Crosslake custom home builder, draws from a wealth of experience in both commercial and residential projects. With over 22 skilled employees, B-Dirt offers only the very best products and services when you become part of our family. We realize how daunting the prospect of remodeling or building a home can be, which is why we make it as seamless as possible for you, keeping you educated and informed every step of the way. If you're not sure what makes more sense for you, to reboot an existing area or rebuild completely, we will go over your options and offer expert advice during your no-cost consultation. At B-Dirt, we pride ourselves on customer satisfaction. We don't simply build projects, we build relationships. Call (218)-821-5243 today and set up your consultation. We look forward to building with you! B-Dirt, Brainerd general contractor, also proudly serves Aitkin, Alexandria, Baxter, Crosslake, Fifty Lakes, Gull Lake, Walker, and surrounding areas. One increasingly popular service we offer is conversion of your seasonal or lake home into a year-round residence. Whether you're retiring or just looking to settle into one place, B-Dirt makes your dreams come true. Perhaps only minor additions are needed. Perhaps you want to add an additional wing or level to accommodate visiting family. Whatever your vision, B-Dirt will bring it to life on time and on budget. 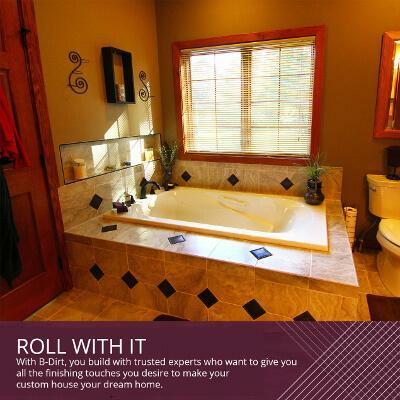 Call (218)-821-5243 today and build your dreams with B-Dirt. B-Dirt, Brainerd residential contractor, knows that often the best way of getting the home of your dreams is building on what you already have. Home additions are an excellent way to redo your space and update your living areas. What's more, when you join the B-Dirt family, you are guaranteed the best materials, the best craftsmanship, and the best contractors. When you build with B-Dirt, your project will be delivered on time and on budget. Make this year your year. Add that master suite. Put in that sun porch. Add a whole new floor. Our popular CAD 3D software brings your vision to life before the first board is even purchased. Call (218)-821-5243 today and discover the B-Dirt difference. Just as seasons come and go each year, we also have seasons in our lives. B-Dirt, Brainerd residential home builder, is on hand to help your home change and adapt with your seasons. Redesign your seasonal cabin into a year-round residence for retirement with B-Dirt. We will get your construction completed on time and on budget. Visualize your redesign first with your free consultation utilizing our popular CAD 3D software. Trust B-Dirt to offer you the best energy-saving additions and options to make your investment a sound one for the future. Turn your seasonal house into your dream retirement home. Call (218) 281-5243 today and get started! 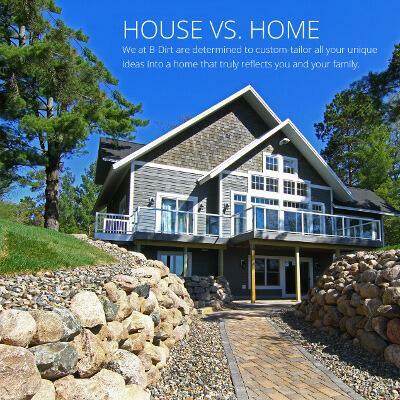 "My wife and I recently finished building a house with B-Dirt, a builder in the Brainerd Lakes area. We wanted to share our experience, which was very positive, especially considering this is the first time we had ever undertaken any project larger than minor remodeling or landscaping. 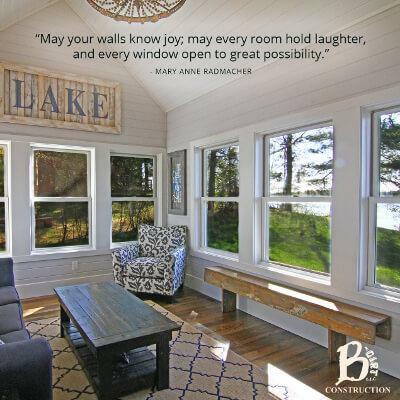 We purchased a lot in Nisswa in 2014...Our goal was to work with a Lakes-area builder with a good reputation who could help us in all phases, from design through execution and finishing details. It was also important for us to have a strong working partnership and relationship with our builder—we live about 2.5 hours away in the Twin Cities , so the whole project was done long-distance, which made good communication critical. We really feel like we hit the jackpot when we found B-Dirt, a family run company with expertise in all phases: design, project execution, and finishing details. 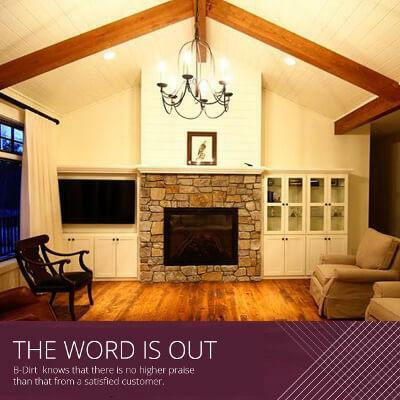 In summary, B-Dirt provided everything we were looking for in a builder: high quality workmanship, excellent communication, attention to detail, and responsiveness to the many changes we wanted to make. 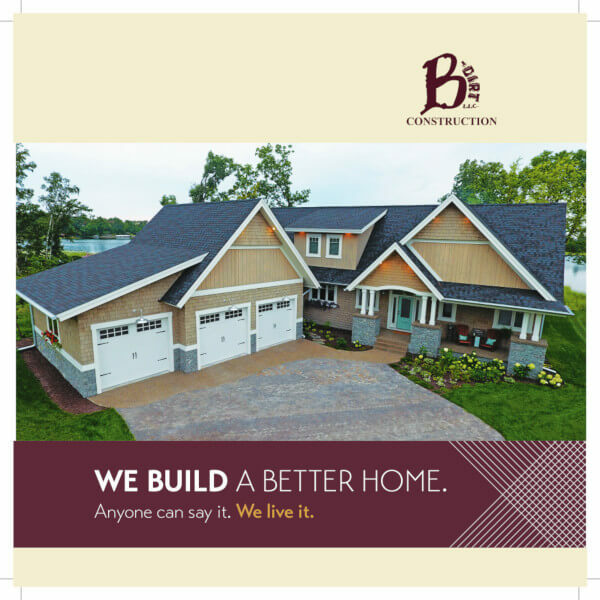 We would not hesitate to recommend B-Dirt to anyone considering new construction in the Brainerd-Lakes area!" We at B-Dirt are excited by excellent reviews like this, and look forward to many more! Call us today (218) 821-5243 and discover the B-Dirt difference!